Earlier this week I read this post, which linked to this post. Apparently there's a blogging thing going around. I missed it, as usual--I'm often behind. For some reason, the idea of writing a post with some confessions immediately appealed to me. This is partly because I feel dry of interesting blogging material at the moment and partly because of this video I watched yesterday, which has been on my mind and heart ever since. On this blog I write about all sorts of funny happenings, and I post pretty pictures. But my life isn't always funny, and it doesn't look pretty all the time. My 1-year wedding anniversary is in exactly 4 days. My 26th birthday is in exactly 2 months. 1. I hate my skin. It's better now, but I still struggle with it (and seriously envy Jordan's smooth skin). Before my wedding, I went to the dermatologist because I refused to walk down the aisle looking like I had chicken pox. But during my four years of college and the three years since, I refused to let anyone get near my face. I recoiled if anyone tried to touch it, and it became a habit to pull my sweatshirt up over my chin so people couldn't see the acne. 3. I wish I had more money. Jordan and I are extremely blessed. We have much, much more than enough. But I still have to daily fight down that twinge of jealousy when I visit someone who lives in a bigger house than I do or has fancier clothes than me. The past year of consistent tithing has really been wonderful in helping me think about "my" money as not mine at all but God's. I need to care less about "stuff." 4. I love Jesus. This obviously isn't any kind of dark confession, and it's certainly not a bad thing. I know I've talked about church and God on this blog before, but just in case there was any confusion: I love Jesus. Am I the perfect Christian? No. But I love going to church and playing the violin in the worship band. Oh, and I listen to KLove. That's right. 5. My dream is to be a freelance editor. No 9-5. No set schedule. Just me editing books. My secret hope (not-so-secret now, I guess) is that someone will find me via this blog and my monthly writing tips, and that will launch my freelance career. 7. I hate how competitive I am. Just once I want to play a game and not get upset if I lose. 8. I wish I were a faster runner. 9. Pinterest stresses me out. So much creativity in one place. So that's a few things about me you probably didn't know. I have five more blessings I could name. And those are important to recognize too. I might make it a link-up (since I know how to do those now). love the honesty. 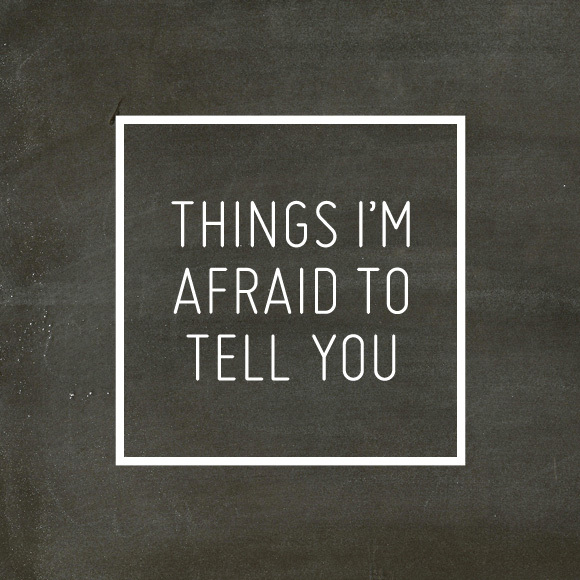 i saw this trend going around too... and really wanted to do my own "things i'm afraid to tell you" post. i still may. but i go back and forth about it. 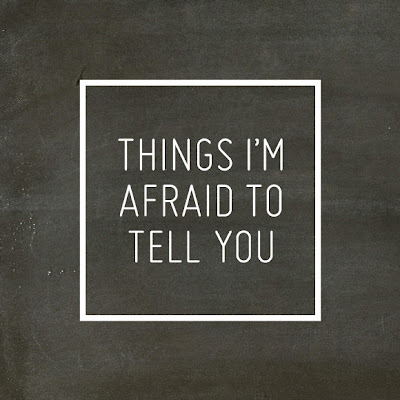 i guess there is not anything i'm actually afraid to say on my blog. but there are things i choose not to. still... i cringe to think that anyone thinks my life is perfect because of what i portray on my blog. someone once told me that my blog makes me appear that i have it all together, and that's so not true. and i often try to let that be seen. so i appreciate the honesty of other bloggers... and posts like this. we have a lot in common! i'm not a fan of my skin, either. it used to be perfect. but i ruined it with the sun and age is taking its toll, too. i also worry a bit about weight gain... especially since having my son. never had to worry about it before that. i SO wish i had more money. not to be rich. but just to live comfortably and have more of the things i'd like to... it's a real lesson in contentment to live beneath my means and not have the things i want. i love Jesus, too! i need to love Him more, though. i rarely blog about my faith, because i feel like it needs to be authentic and "perfect", so when my heart is not right, i feel hypocritical blogging about what i believe, you know? so i tend to leave that part out. but i do make it know that i am a believer, though i don't always use the word "Christian". i hope people will sense it whether i use that word or not by what i blog about and say. i don't have a dream to be an editor, but the dreams and aspirations i do have do not involve 9-5 jobs, either. i love pet names, too! my husband has "millions" for me, and i love them all. i'm not very competitive. not sure why. but i do like to defend my originality or uniqueness... maybe because i am an identical twin?? pinterest stresses me a little, too. i try not to look at the big picture, and use it more as a bookmark tool for myself... staying only on my pins. otherwise, it DOES get overwhelming... you're right! but what a fantastic tool and site, no? last, like you, i love my blog! i've been thinking about writing a post about why i blog... it's been brewing in my brain the past few days. as far as followers go, just keep at it. join communities and comment on a lot of other blogs... i find that is when my readership grows the most. and remember, it's not the quantity of followers, but the quality! you have lovely photos and a great blog. it will grow. you are right... the more followers and comments, the more pressure to reciprocate, and sometimes there is just no time. but your blog will no doubt grow. i like the 10 things idea! i would join you on that! Your honesty is so admirable. We all have things we worry about and hope others don't "judge" us for, but when it comes down to it, they're most often small matters in the grand scheme of things. And they're the things that make us who we are - and the reasons the people in our lives love us. So refreshing! Thank you for sharing - I may just have to take part in the series, too! If we're being perfectly honest here, I hope you never become the kind of blogger who has hundreds and thousands of followers and comments. Don't blog for an audience. Blog for yourself. But I share your secret hope about being discovered via blog. Except I don't want to be discovered as a freelance editor. I want someone to give me a book deal. Hey. Maybe they will, and then I can tell them, "I have the perfect freelance editor for you..."
@AudraIf I become an editor who needs someone to write a book deal, I will pass them to you as well. We're a good pair like that. I love your honesty and I love that you're on GoodReads. I've been obsessed with that site lately! I love your honesty! I don't think you're the only blogger who's wanted more followers. I feel the same way, but then I remind myself that I want people to follow me because they really want a be a part of my world via the blog! Also, I'm super competitive too. I mean if you don't play to win, what's the point of playing? Oh, I'm a new follower! ps I read a few other of your blog posts today and I also TOTALLY relate to the husband with a beard thing!!! It can get wild!